It tailgating time again! I've seen these corn dog muffins all over Pinterest and decided to give them a try. I made the cornbread from scratch, but you could use a box of cornbread mix if you prefer. These were quick and delicious! Chicken Legs doesn't like hot dogs, but agreed that these corn dog muffins were excellent. They are great for watching the big game or even dinner. Serve them with some mustard or ketchup for a crowd pleasing great snack! Preheat oven to 400. Lightly spray a mini-muffin pan with cooking spray. Cut each hot dog into 6 1-inch pieces. In a medium bowl, whisk together eggs, buttermilk, honey and melted butter. Slowly stir in flour, baking powder, salt and cornmeal. Stir until combined. Drop one tablespoon of cornbread into each mini-muffin cup. 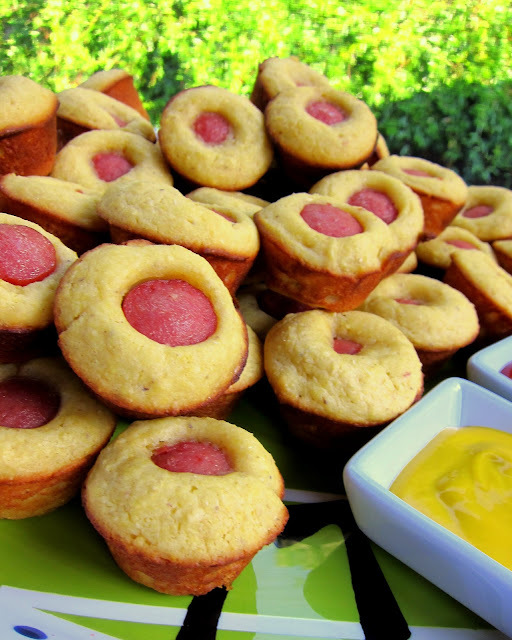 Place one hot dog slice into the middle of each muffin cup. Bake 10-12 minutes, until cornbread is golden. Allow to cool and serve with mustard, ketchup, ranch or BBQ sauce. What a fantastic idea! We love corndogs around here- being a house full of menfolk. Annnnd there's a ballgame this weekend so I'm thinking this will go on the menu. The packages of the cocktail sausages would probably work, too. Sounds good. Perfect for tomorrow against LSU ;) War Eagle!! I couldn't wait until tomorrow, so I just made this with some Jiffy cornbread mix & kielbasa sausage I had on hand and it turned out so good! So good, I may have to make it again tomorrow for the game! I could see this rocking with specialty dogs even more. Yum! I am adding these little doggies to my July 4th menu. My boys and the Ex-Ex will love them! Yum!! So is the Jiffy mix just as good for this recipe, or does it make a difference to make the "real thing?"